G4K Red Fire Dragon Escape is another point & click escape game developed by Games4King. A red dragon lived in a beautiful and magnificent city. The creature was serving the people of that location, when he got unexpectedly stuck in a house there. Your duty is to rescue the mythical monster. It will help you to find the hidden clues in the form of colours and numbers and to locate the items in the environment to save the animal. 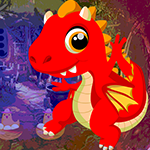 Find them all and solve all puzzles to free the red fire dragon. Good luck and have fun! one of the puzzles doesn't have an extra clue - look carefully at the outlines - they are very faint! Thank you Gwenyth and Jon I was going crazy looking what to do next. I would of never seen that. When clicking on green balls on scene where numbers are found on the wall to the right, be sure you slide your mouse. Then you can see the lines and the balls stay lit.